Can I create conditional dropdown boxes? Hello, I just posted this quesitons on the support forum, but in seem to have email support which gets answered faster than the forum support...at least this is mentioned onyour pricing page. I just need to know whehter when you create drop down boxes whether you can have it linked to another drop down box ...so conditionality. I am trying to create a delivery schedule and need to set different time slots based on locations. So basically if customer lives far away, less options in terms of time slots and days vs client is more central and therefore has 2 time slots per day, everyday as an example. so the condition would be based on locations. I apologize for the delay in answering forum questions. Anyway, this can be done by using conditions in your location drop down. You would need to create multiple drop downs for the time slots. Basically, the number of dropdowns for the options in the time slots and days depends on the number of location choices in the location drop down. Take a look at this Example Form the 3rd drop down is affected directly by what was selected in the 2nd drop down. This is achieved by setting a condition that shows/hides corresponding drop downs depending on the selected option in the 2nd dropdown. As shown in the screenshot above, I have created 3 dropdowns for the model, as I only have 3 choices for the make. You may apply this same logic in your forms to achieve this same effect. 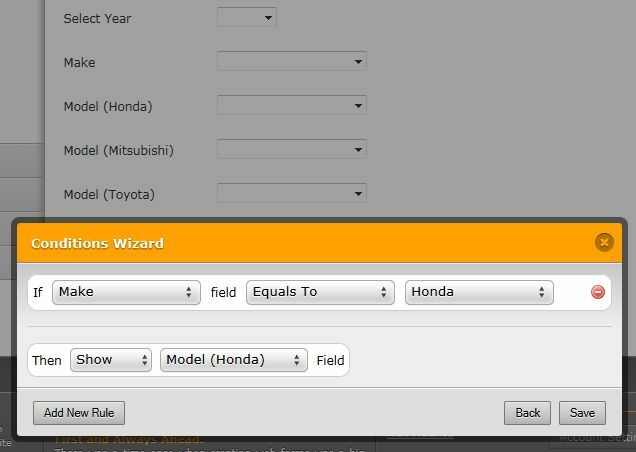 Note that you may also use different form fields in place of drop downs, in fact you can even hide/display multiple fields. Hope this was of any help to you. Let us know if you have additional questions. I cant see the image in your comment (image link is broken)! Can you explain the steps to do it? I have just fixed the issue with the image for you. If you have any further questions, please do let us know over a new thread since this is a very old thread (from 2011).